Being self-sufficient from solar power is becoming increasingly attractive to commercial companies and municipal undertakings. Finding the best solar batteries can be difficult – as demonstrated by our tour around the trade fair in Munich. Munich, Intersolar and EES Europe 2017: Every day at 10.30, many solar technicians, specialist planners and potential users would make their way to the photovoltaik stand to get the latest first-hand information on storage systems for commercial and industrial applications. The tours headed by our storage expert Herbert Grab first went to the nearby stand of Solarwatt. Once there, the participants were welcomed by Axel Schiller. He is head of customer service at the Dresden-based storage supplier. In Munich, Solarwatt was awarded the important EES Award for their new battery storage unit MyReserve Matrix. This award that is highly-prized in the industry is awarded every year for pioneering developments in storage technology. Two years earlier, the previous model MyReserve (for private customers) also managed to score this prize. Generally speaking, the Matrix is made up of two basic components: The command module and the individual battery modules, which can be combined in any way necessary. Five battery modules of 2.2 kilowatt hours each can be controlled by one command module. Each of the modules is about the size of a shoe box and weighs around 25 kilograms. By simply re-combining the two basic components, any storage capacity from 2 kilowatt hours to 2 megawatt hours can be realised. That makes the MyReserve Matrix equally appropriate for domestic applications as for commercial settings. With every battery module, the output of the system goes up by 800 watts. “This means that the MyReserve Matrix is suitable for pretty much any application,” Axel Schiller sums up. Another winner of an EES Award was Energy Depot, founded in 2014 by Roland Burkhardt. He used to be the founder of Sunways in Konstanz and is involved in the solar industry since 1985. Energy Depot presented a new commercial storage unit capable of operating in grid-parallel of off-grid mode. The hybrid inverter Centurio is nerve centre of the energy storage system and allows the integration of PV array, battery packages and the grid. The modular system offers storage capacities between 8.2 and 32.8 kilowatt hours. The hybrid inverter has an output of up to ten kilowatts and is characterised by very good efficiency at partial loads. Also, it is set up for emergency power supply on all of its three phases (at 3.3 kilowatts each). Thanks to the included high-voltage battery, the system achieves an efficiency of up to 95.4 percent. Even at a partial load of just ten percent, the inverter manages to be over 97 percent efficient. To get the desired storage capacity for larger systems, a number of Centurio inverters including their batteries can be combined. The next halt on the tour was Eaton, where the presentation was held by Kai Zimmermann, involved in their Department for Commercial Buildings. Eaton is active in more than 175 countries and has a staff of 97,000. They specialise in energy management solutions. Eaton is in a close partnership with Nissan and AES, the result of which is, among others, a wide range of scalable storage units – from private homes to commercial to grid-scale storage. The commercial-scale storage systems made by Eaton are marketed under the brand X-Storage Buildings. They were developed in cooperation with Nissan and, according to Kai Zimmermann, are based on 100 years of competency in energy management, the experience of the leading manufacturer of EVs and over 15 years of own experience in battery manufacturing. The storage units X-Storage Buildings can be operated both in combination with a PV array and the public grid. It has a wide range of applications: For instance, users can lower their electricity costs by charging up the storage unit when renewable electricity is available or grid power is cheap. Unutilised capacities are used for grid services (balancing energy) or to manage peak loads. The energy storage systems by Eaton are available for commercial (X-Storage Buildings) and private customers (X-Storage Home). At the stand of Refu Elektonik, participants were welcomed by Dev Micknaus and his colleagues. The company from Pfullingen in Swabia is part of the Prettl Energy Division and confidently position themselves a “pioneer for frequency inverters and trailblazer in energy storage systems”. Refu develops and sells solutions for solar, storage and hybrid applications. They now have 250,000 inverters on the market. In concert with the two companies Endress and Kirsch (also part of the Prettl Energy Division), Refu Elektronik covers the entire range of hybrid applications. 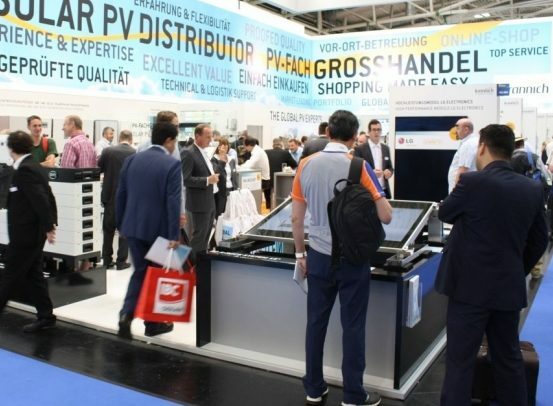 At the Intersolar, the experts from Refu presented an AC-connected and a DC-connected storage system. The AC-connected system was especially designed for being combined with PV. According to the manufacturer, it is ideal for applications such as peak shaving, i.e. avoiding load peaks when power is expensive. The system is very suitable for retrofitting existing solar generators. The PV array and the battery can be installed and used completely independent of each other. In the words of the Refu experts, the system offers a high degree of flexibility when it comes to designing the solar installation and the storage unit. According to Dev Micknaus, the ideal unit for self-consumption is the DC-connected battery storage unit. This compact system is scalable from ten kilowatt hours all the way up to a large-scale unit for use by solar power plants and utilities. Christof Wiedmann is head of sales at the Deggendorf-based storage supplier Fenecon. Key partners of the company are utilities, installing companies and specialist wholesalers. In addition to innovative solutions for storage systems and their applications, Fenecon develop software solutions for energy management. Fenecon are putting a lot of energy in to electric mobility, most of all in their position as “official innovation partner” of BYD, one of the largest manufacturers of EVs, electric buses and storage systems in the world. BYD, headquartered in Shenzhen near Hong Kong, has more than 220,000 staff and generates an annual turnover of more than 13 billion US dollars. BYD produces lithium iron phosphate batteries, whose service life they state as being over 20 years. Another remarkable feature is the high C rate. The battery units can be fully charged or discharged within an hour, i.e. they are able to produce very high currents. The Fenecon stand presented four storage systems: In addition to the small domestic unit Fenecon Mini, there was the smart Fenecon Pro for users with an annual power demand of over 5,000 kilowatt hours. Also on show was the commercial unit Fenecon Commercial for over 30,000 kilowatt hours of annual power demand with 40 kilowatts of charging and discharging output and 40 kilowatt hours of storage capacity. Lastly, there was the Fenecon Industrial: This grid-serving industrial-scale storage unit is targeted at large consumers with an annual power demand of over 100,000 kilowatt hours. It produces 100 kilowatts of charging and discharging output and has 100 kilowatt hours of storage capacity. At the Tesvolt stand, Mathias Zdzieblowski was already waiting for the participants. He is an acknowledged expert in commercial storage. The Wittenberg-based company has specialised in commercial- and industrial-scale lithium ion storage units. Their products can also be charged and discharged at a very high C rate. Tesvolt state that their units have an efficiency of over 98 percent and a service life of up to 30 years and 8,000 charging cycles. At the Intersolar, the company presented their new industrial-scale container unit Tesvolt Power Storage (TPS). It can be set up indoors as well as outdoors and protects the storage unit against external interference. The containers are available in the standard sizes of 20, 40 and 45 feet. Once it is delivered to where it is used, it only has to be connected to SMA’s Sunny Central Storage component, which is also comes as a container unit. Given the current prices for peak loads and the tariffs for balancing power, Tesvolt estimates the payback period on the European market to be four to six years. The battery cells in the Tesvolt units are arranged in a prism and are produced by the Korean manufacturer Samsung SDI. “This particular arrangement and the chemical composition of the cells allows us to reach very high charging rates,” Mathias Zdzieblowski explains. The battery is operated by combining a number of charge controllers (Sunny Island by SMA). The more stand-alone inverters and the greater their output, the more power the system can store and discharge in a shorter timeframe. The PV Guided Tours ended at Hoppecke Batterien. This battery supplier is located in Brilon-Hoppecke, halfway between Kassel and Dortmund. The company has a reputation of being an expert for industrial energy storage. With 20 subsidiaries, branches, partners and distributors as well as production and assembly facilities all over the world, the company has about 2,000 staff and generates an annual turnover of over 400 million euros. Bastian Hassdenteufel and his colleagues from product management presented the solutions that Hoppecke had brought to Munich this year. These included their new lithium ion domestic storage unit as well as the new large-scale hybrid storage unit Sun Systemizer, which has been installed at the company headquarters in Brilon-Hoppecke. The Sun Sytemizer combines lead and lithium batteries and most of all helps to stabilise the power grid. To maintain the grid frequency at 50 Hertz, the hybrid storage unit takes in surplus energy as needed, and is also able to feed it back into the grid at short notice. Furthermore, this large-scale storage unit has other applications, such as intelligently storing power for decentralised supply systems: In a grid where there are many smaller renewable energy generators, the storage system buffers a fluctuating power inflow against equally fluctuating consumption. That way the Sun Systemizer can act as off-grid storage in areas where there is no public grid. The system is also useful for e-mobility applications or in cooperation with energy exchanges.